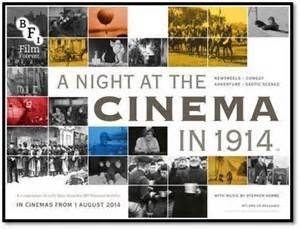 Screened at the Hyde Park Picture House as part of the Centenary Programme on November 7th 2014. Pioneering British aviators Gustav Hamel and Bentfield Hucks perform stunts at the legendary Hendon airfield. Although not hard news, this was a topical story. The leading campaigner for votes for women, Emmeline Pankhurst, goes to petition the King in person at Buckingham Palace. The campaign for votes for women was very high-profile and often featured in the news. The suffragettes would stage appearances at events for maximum impact. Following the assassination of Archduke Franz Ferdinand in Sarajevo, this newsreel shows footage of the Austro-Hungarian royal family, including the wedding of Archduke Karl who succeeded Franz Ferdinand as heir to the imperial throne. Following the death of Captain Scott, Sir Ernest Shackleton plans another expedition to Antarctica, taking plenty of dogs. This is typical of the ‘magazine’ style film shorts of the time. American Vitagraph studio star Florence Turner ran her own film company at the Hepworth studios on the Thames. In this comedy ‘dial’ means ‘face’. The ebullient Daisy Doodad practises for a face-pulling competition and ends up getting herself arrested. This travelogue of the famous sights of Egypt shows Lord Kitchener as British Consul General before he was made Secretary of State for War. In this film with colour tinting, he is seen reviewing the troops. Fred Evans was the most popular British comedian of the age, turning out hundreds of ‘Pimple’ films which made a virtue of their low budgets. Here Pimple foils the plans of dastardly foreign spies. If Monty Python had made comedies in 1914 they would look like this. As the nation gears up for war even the young are mobilised to help the war effort … Here a pair of Sea Scouts are on the look-out on the cliff tops for an invading fleet. When Germany invades neutral Belgium, the destruction of the historic town of Louvain and its ancient university library provokes worldwide outrage. This newsreel was presumably filmed by a cameraman from a neutral country. General French, commander of the British army in France, gets the better of the Germans in this lightning sketch by pioneering animator Lancelot Speed. Animation was popular and commonly distributed as part of the newsreels. Cartoons allowed Speed to be splendidly irreverent. Troops celebrate Christmas at the Front. We’re not told where for reasons of national security. But it’s good to see the boys being well fed before they return to the trenches. American imports were always popular and serials were the latest sensation in 1914. In this excerpt, Pearl White stars as Pauline, a feisty heroine pursued by villains eager to get their hands on her fortune and features both an accidental hot air balloon trip and a spectacularly daring rescue from a burning building. Years before the arrival of the ‘talkies’, this Vitaphone song film (which wonderfully shows the ladies fashions and dance moves of the day) would have been accompanied by a synchronised sound disc, which is now lost. The song is recreated here from the surviving sheet music. The Vitaphone was a British sound on disc system pioneered by Cecil Hepworth. In 1914, Hollywood is born and British comedian Charles Chaplin is its greatest star. He explodes onto British screens in summer of that year. This is one of his very first films and is, appropriately, set in a cinema. Compiled and distributed by the British Film Institute 2014.